Whether you’re starting a business from scratch or moving your existing business from your home office, how you furnish your office space can really make a difference – some even argue that the right office furniture can increase productivity. When you’re looking for a new office location, finding the right space is half of the battle – but furnishing it well can be another struggle all by itself. And so, at The Workstation, we offer both ‘Essential’ and ‘Directors’ furniture packs as optional add-ons for all our clients, designed to enable businesses who have chosen one of our locations as their new base to settle in as quickly and easily as possible. Our essential furniture packs are great for businesses with a limited budget who want to hit the ground running with some good-quality fundamentals for the office. a wall clock and protective perspex chair matt. 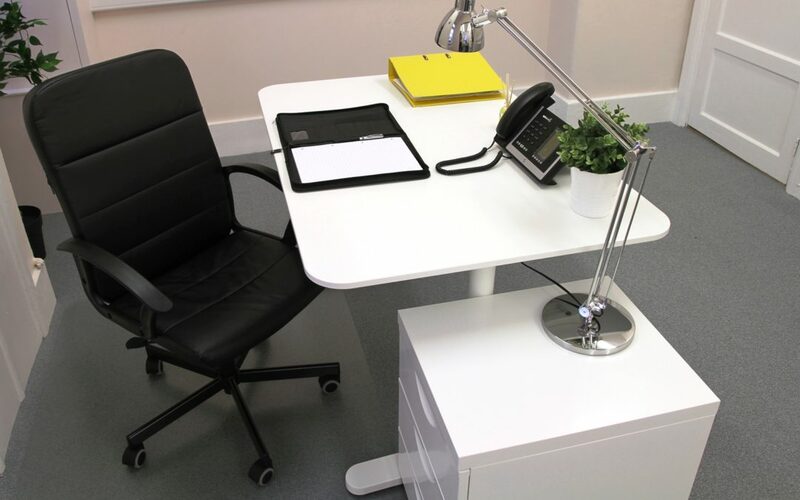 Our Directors Furniture Packs have everything that you’d need from an executive workstation. All furniture and fittings come ready assembled and installed so you can get to work in your newly furnished office from the moment you open the door. Just like moving home, moving business premises can be a stressful time – there may be lots of jobs on your list to get through which is why this optional add-on can really come in handy. At a time when you might be trying to get your business off the ground or keep operations running smoothly during this transition, furniture packs can help relieve you of at least one big task on your to-do list. If you would like to find out more about our furniture packs (including information on pricing) or if you’re looking to arrange a viewing of available office space at one our business centre locations, please get in touch here.